Posted under Library, Reference Question, Technology on Saturday, May 1st, 2010 at 6:04 am, by Brian Herzog. Post and comments available via the RSS 2.0 feed. Both comments and pings are currently closed. That’s a neat trick, I will keep that in mind. 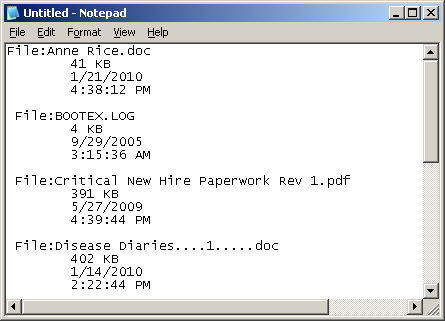 Another way to do this, if you have Textpad (beefier, far more useful version of Notepad), is to open all files up in Textpad (even if they are not text) and use the Copy File Names command. wow – too cool – i totally didn’t know this and i just passed it on to another coworker! cool! @Chrissy: I did not know that. Although, it could get unwieldy with some of our patrons. @george: Thanks – but unfortunately, we have Start->Run locked down on our public workstations, so patron’s can access it. I’ve done it at the desk for people before, but I like showing people things they can do themselves. @Kersten: You are welcome – I’m just sad it took me this long to realize it. Very cool! Many’s the time I’ve wanted a quick way to do this. FYI, for hard copy, you can – obviously – just print the list from the browser window, or if you have Adobe Acrobat on the computer, “print” it to a PDF. The file names will be hyperlinks in the PDF, too. Is the light bulb (on your head) LED? It doesn’t look like a normal incandescent. @Sharon: That’s not actually me, just a Creative Commons photo I found to illustrate my post – I am a far less attractive model. @r e: Thanks for the tip – I’ll read through it and see if I can get that set up on at least out desk computers.